Originally from Malaysia, the carambola tree is a rugged tree that grows in hot and humid climates in tropical areas, producing fruit throughout the year. These fruits have five to six distinctive ridges, and once sliced, resemble a perfect star. Although they mostly serve as decorative items, they are also delicious to eat, and full of vitamins A and C, and minerals including potassium. 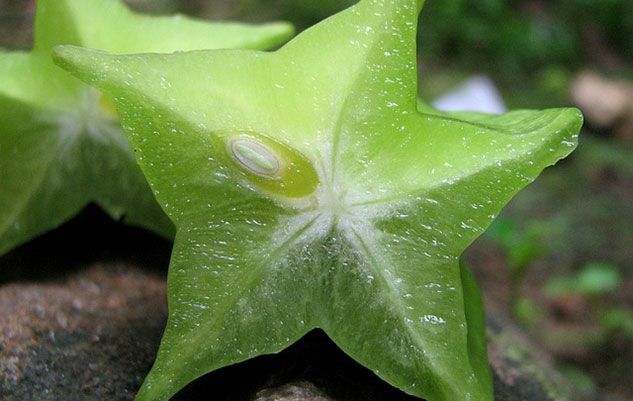 In stores, star fruit are often pale green in colour because they are immature and it is best to let them ripen at room temperature until they turn a beautiful yellow with slightly brownish tips. They are eaten raw in salads, but can also be lightly sautéed and served with poultry and seafood. Originally published in the Journal de Montréal on May 3, 2014.